Throughout time art has been a medium through which people have documented significant events in history. However, over the years art has evolved and become a method of expression, while photography has replaced painting as the prime means of creating accurate visual records. In hyperrealism, the boundary between painting and photography blurs. Hyperrealist paintings are often so similar to high resolution images, making it difficult to recognise the difference between photography and the skilful use of oil and watercolour. But in a world where high-tech photography and instant photo messaging is available at our fingertips, what does hyperrealism give us that photography cannot? Hyperrealist paintings are often accused of being excessively explicit, with so much attention to achieve a perfect rendition of a photograph, it leaves little room for conceptual depth. However, Spanish artist Javier Banegas uses a suggestive approach that encourages the viewer to reconsider their interpretation of hyperrealism. Banegas creates monumental still life paintings of close-up everyday objects, adding discreet human narrative to otherwise photographic compositions. 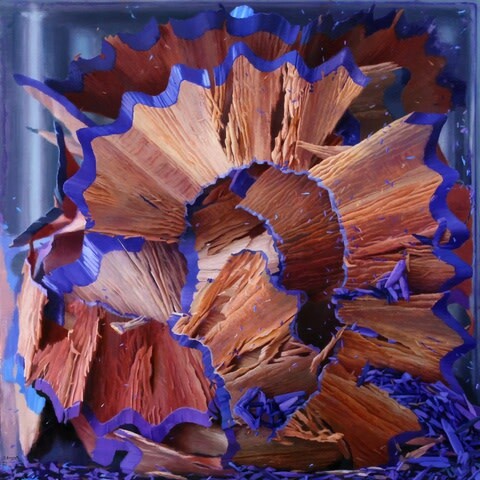 He explores interaction with these items and depicts his subjects in a state affected by human touch - for instance, shavings left behind from somebody sharpening a pencil as seen in “Shavings V”. Just as a photograph would capture an object in a single moment of time, Javier Banegas paints objects, devoid of life, in a period of transition. The subjects of his paintings are inanimate, therefore they are not suspended in life, but are instead captured after action. This gives the impression that someone, somewhere is not quite finished, adding a narrative quality that enables the viewer to create their own stories behind each painting. The presence of human interaction is present in all of his works and denotes a passing of time, giving us more than a photograph ever could. "In this world of globalised instant images, painting continues to maintain a significant role in recording the permanence of emotion, the footsteps of man through the world that he inhabits and the objects that surround him. I avoid creating the spectacular images in order to create those which encapsulate these areas." Hyperrealism allows for a less strict interpretation of images. Many hyperrealists manipulate photographs to create compositions that emphasise cultural, social or political messages. The subsequent narrative can be immensely meaningful and open to the interpretation of its audience. 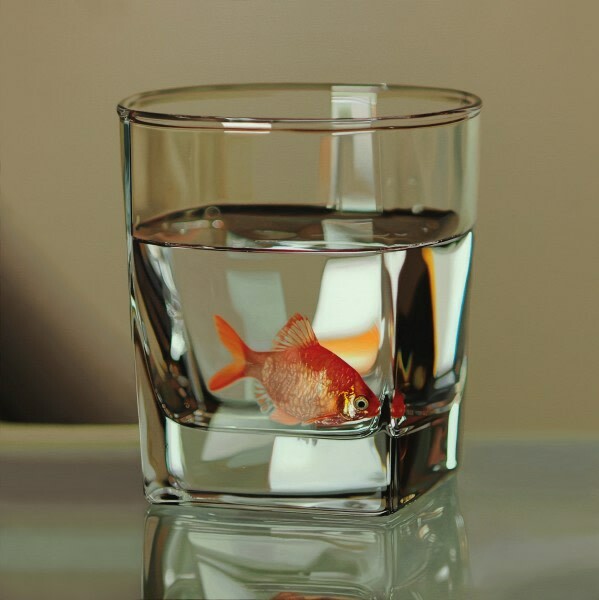 Young-Sung Kim, for example, uses his paintings to deliver a visual critique of materialism in society. Kim, born in Seoul, South Korea, uses contrasting subjects to illustrate the difference between the living and material. He concentrates his exploration of life on small creatures including snails, frogs and fish. 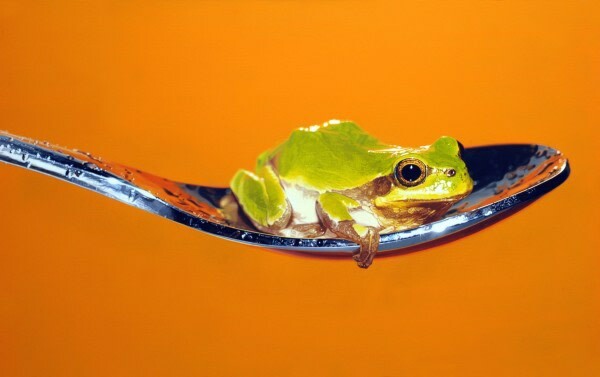 Many of his paintings, such as his “Nothing, Life, Object” series, feature these creatures resting on man-made objects such as cutlery and drinking glasses. In a society where ideas and values are increasingly rooted in commerce, Kim’s compositions encourage the viewer to consider the importance of life when it coexists with the material. Kim maintains that the animals in his paintings are representative of today’s society where humans seem to be living happy, stable lives, but are in fact adapting to survive in a confined space that is completely exposed to others. Photography allows a viewer to record a specific scene at a particular time, capturing only what is visible to the naked eye. In contrast, hyperrealists are able to add or remove elements from photographed scenes to add their own unique perspective onto a real image. 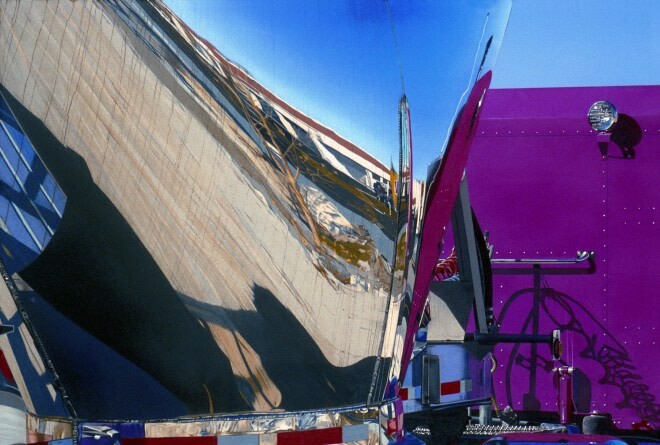 Andrew Holmes, for example, takes photographs of automobiles and other metallic objects as subjects for his pieces. 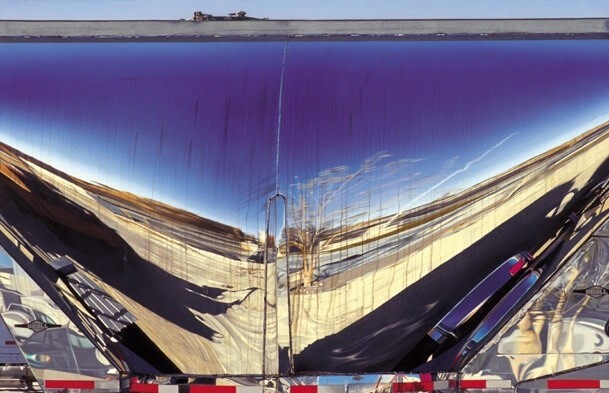 He then creates an almost immaculate rendition of the photograph, but in his interpretation, he paints his reflections out of the photographs. At once the painted image is spectacular and offers more than a photograph ever could. The painting shows the viewer what one might see in true life due to the skilful hyperrealistic technique, but also, with the absence of human reflection, presents an entirely impossible image. Technological advancements in recent years such as photo editing allows for the refinement of photography. However Hyperrealism is able to create a narrative that photography cannot. A photograph will accurately document a moment or an event in time, which does not require the viewer to do anything else but observe. A hyperrealist painting requires a certain amount of participation from the viewer to see beyond the surface level of what seems like the perfect imitation of a photograph.